September is Healthy Aging® Month. Healthy Aging® Month is an annual observance designed to focus national attention on the positive aspects of growing older. Today, due to numerous medical and scientific advances, people are living longer than ever before. But it doesn’t happen automatically—you have to be good to your body, mind, and soul. 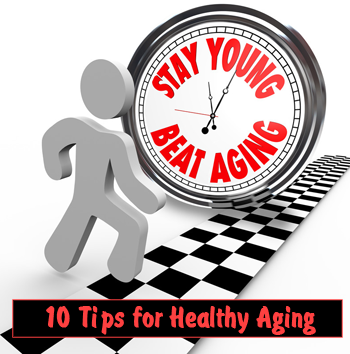 The following 10 tips are a good start for getting you on your way to living a long and healthy life. Eat a balanced diet – one that is rich in fruits, vegetables, whole grains, and fiber and low in saturated fat, trans fat, and cholesterol. A well-balanced diet can provide your body with the essential nutrients needed to achieve and maintain optimum health. Be physically active – try to incorporate 30 minutes of activity into your day, every day. The options are endless; start walking on the beach in the mornings, join a yoga class, try jogging with a friend, sign up for a basketball league, or go for a bike ride in the afternoons. Make sure you choose activities that you enjoy, that way you’ll be more likely to make them a habit. Get regular preventive check ups – see your doctor regularly; remember your doctor is your partner in healthcare. The two of you are working toward the same goal—your optimum health. By having regular check ups, you may be able to catch small problems before they become big problems. And, it is just as important to visit you dentist regularly as well. Don’t smoke – cigarette smoking is the number one cause of preventable death. This year alone, more than 400,000 people will die from smoking-related causes. It is never too late to quit. Your body will begin to feel the benefits almost immediately. Did you know that after one day of quitting, your risk of having a heart attack decreases? Always wear your seatbelt and bike helmet. Use smoke and carbon monoxide detectors in your home. Don’t go for a run, walk, or jog at night by yourself. Most attacks happen to people who are alone. Just by bringing a friend, you reduce your risk. Use medicines wisely: follow directions and ask your doctor or pharmacist about side effects and drug interactions. Keep your home well lit and free of things that could make you fall. Avoid environmental extremes- protect your skin when you are outdoors—don’t get too much sun. Dress appropriately for the weather and avoid getting too hot or too cold. If you drink alcohol, do so in moderation – for a man under 65, moderation means no more than two drinks a day; for a man over 65 or a woman of any age, moderation means no more than one drink a day. One drink is one 12-ounce bottle of beer, one 5-ounce glass of wine, or 1.5 ounces of spirits. Keep your personal and financial records in order – start planning now for your long-term housing and financial needs. For information on banking, saving, buying, getting credit, and investing, check out Consumer.gov at http://www.consumer.gov/yourmoney.htm—an excellent resource that can answer many of your questions. Stay in touch with family and friends – get to know your neighbors. Take the time to be involved with your community. By creating a strong social network, you will not only have friends to celebrate with when good things happen, but also a support system in difficult times. Keep a positive attitude – studies have shown that people who have a positive attitude tend to live longer, and lead healthier and happier lives. Don’t take it all so personal; rarely does it really have anything to do with you. Try to find the humor in life. And remember to laugh; several studies have shown that laughter makes you feel better. But really, who needed a study to prove that. Just laugh, and you will know it is true. This entry was posted in Aging on September 7, 2013 by Hayes Clinic.